Keep up to date with the latest news, updates and announcements from the NZ Mega 2020 team. These are listed in reverse chronological order with the most recent news items at the top. NZ Mega 2020 Website Launched! Welcome to the official website for the NZ Mega 2020 event to be held in Auckland, New Zealand in october 2020 - celbrating 20 years of worldwide geocaching, and 20 years since New Zealand had the very first geocache hidden outside of USA - all the 20s! Of course this is only just the beginning and a lot more information and updates will be added over the coming months in the lead up to this event, so keep an eye on this website, and subscribe to our mailing list so that you can be sure to be first to hear about what's going on at mega HQ. Fundraising Geocoins - Available Now! The NZ Mega 2020 team is proud to announce that a New Zealand 2018 geocoin has been minted by our principal sponsor, Geocoins.nz and is available now, with all proceeds from coin sales going directly to the NZ Mega 2020 event. Yes, that's 100% of the proceeds from these coin sales going to the mega event. Four versions of the coin have been minted - two shiny Nickel plated limited editions with green and blue kiwi, a very limited edition antique gold version (shown in the picture), and an extremely limited edition antique silver version of which only a single coin will be available for public sale. So get in quick and order yours now from the store and add this beautiful coin to your collection! We are proud to announce the principal sponsor of NZ Mega 2020 - Geocoins.nz is a small New Zealand owned and operated business that designs and mints exclusive runs of New Zealand themed geocoins, for the purpose of contributing and supporting the New Zealand geocaching community. 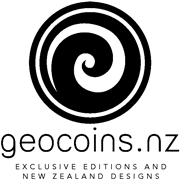 Geocoins.nz has offered the free use of their web store for all NZ Mega 2020 merchandise, including geocoins, accommodation, meals, and other goodies, as well as providing their design and minting services for NZ Mega 2020 related products. Please show your support for them and for the NZ Mega 2020 effort by visiting the store and taking a look at all the cool stuff on offer. At an event during the highly enjoyable and successful WENZ Mega Event weekend in Wellington, Ron (Agazo) and Chris (funkymunkyzone) officially announced the formation of the organisation team that will be leading the efforts for the Mega Event celebrating geocaching in 2020, with the event to be held in Auckland. The event will take place over Labour Weekend (23rd to 26th October), which has become the traditional time of year for mega events in New Zealand.